All is well in Botany Pond. It’s a warmish day today, and the ducks are swimming around in the cool water, but the temperature will drop about 15 degrees F tonight. The next few days, which include the beginning of fall on Saturday, should be lovely. Honey and James are the best of friends now, eating and swimming side by side with no antagonism to be seen. Can we expect a big paddling of large ducklings next year? Here are a few pictures and two videos from the last few days. 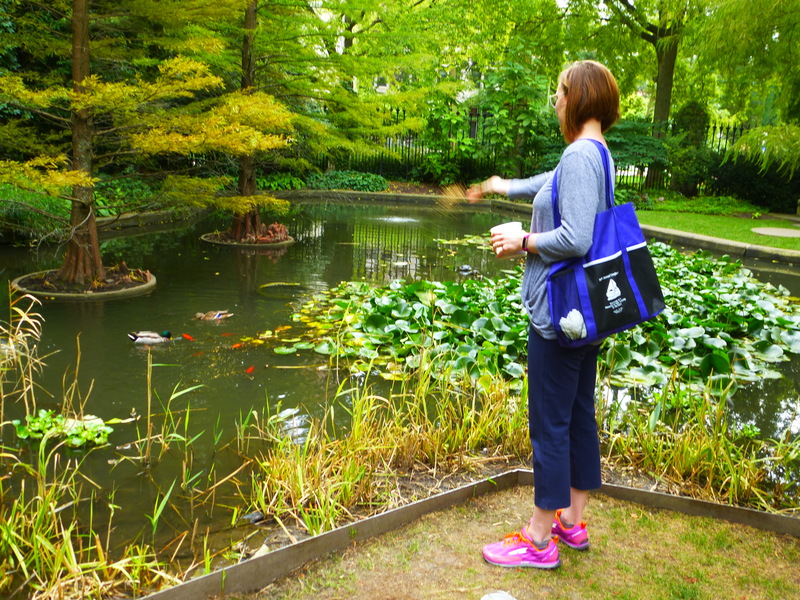 Anna tossing pellets to the ducks. It always amuses me that James looks up when corn and pellets are coming down, as if to gauge their trajectory. We have a video of that below. Honey doesn’t look up. 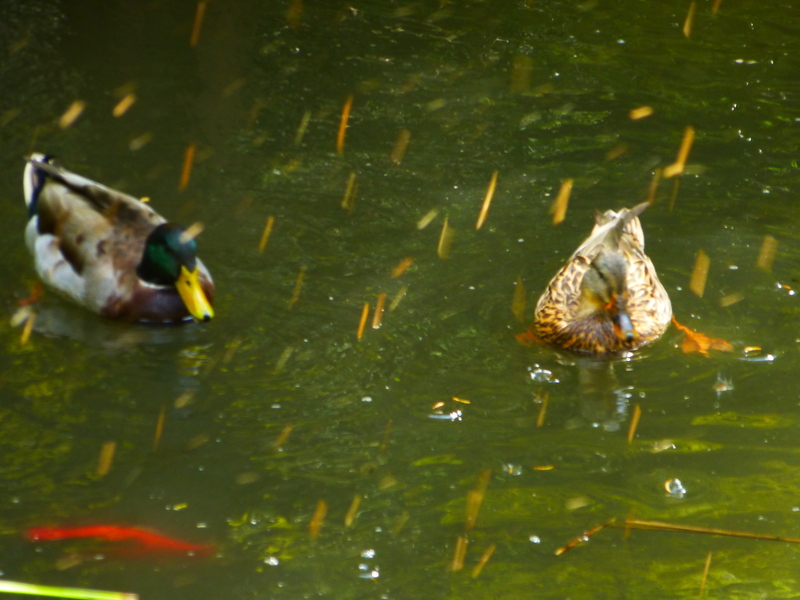 Duck food raining from the sky! 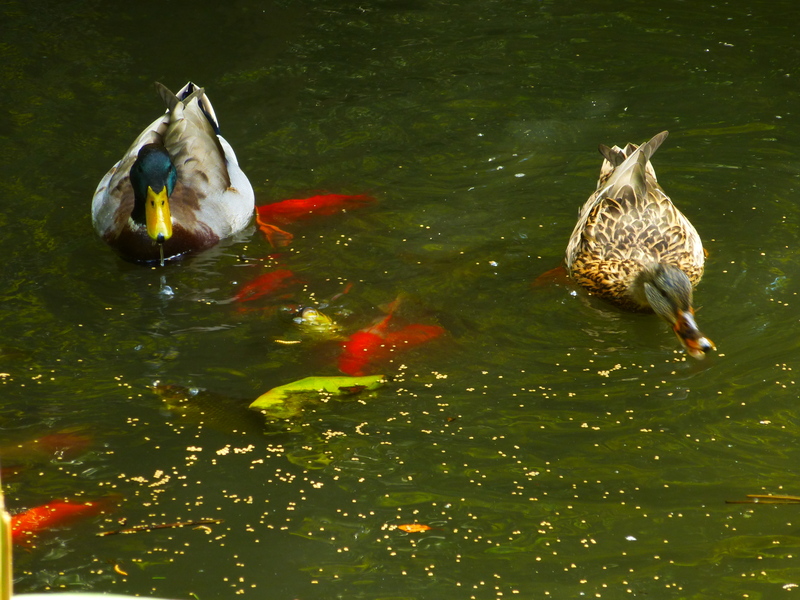 Lately there’s fierce competition for duck pellets and mealworms between the mallards, the koi, and the turtles. Fortunately, the ducks always get the lion’s share, but there’s plenty for the other creatures. The happy couple on their island. This entry was written by whyevolutionistrue and posted on September 20, 2018 at 2:45 pm and filed under ducks. Bookmark the permalink. Follow any comments here with the RSS feed for this post. Both comments and trackbacks are currently closed. I hope you folks are putting up a lodge for them to overwinter in because they don’t seem to be going south. 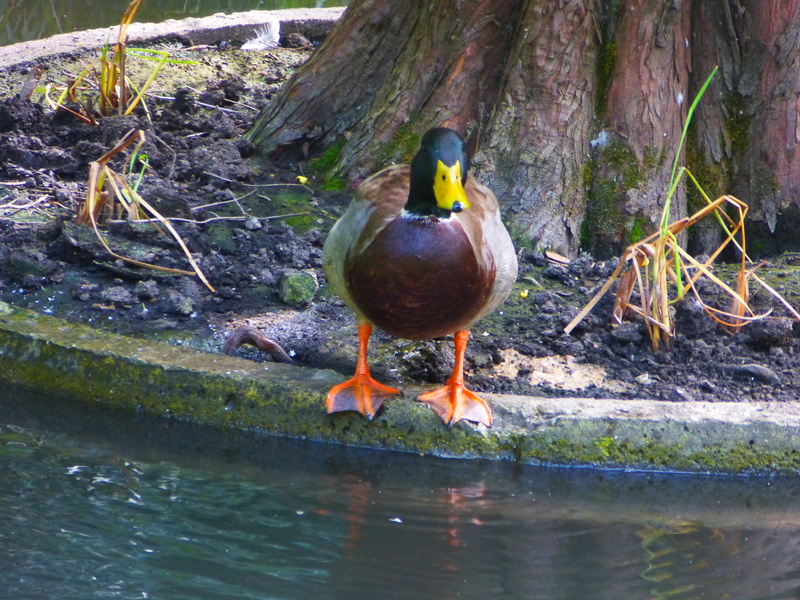 Ducks do not leave until it gets colder – often after the first frost. I expect them to be around until at least the end of October. The difference between this year and last year is that Honey has already paired with James. Last year, she was alone when she left Botany Pond. The advantage of Honey and James staying at Botany Pond is that James does not have to fight off other males. He will have to do that once they join the large duck collective. As far as I can tell, nothing (bird wise) has left Chicago so far. We are at least a month from that. Migration time is unmistakable. You hear it and you see it. There were flocks of geese leaving the area in December, after the first snow. 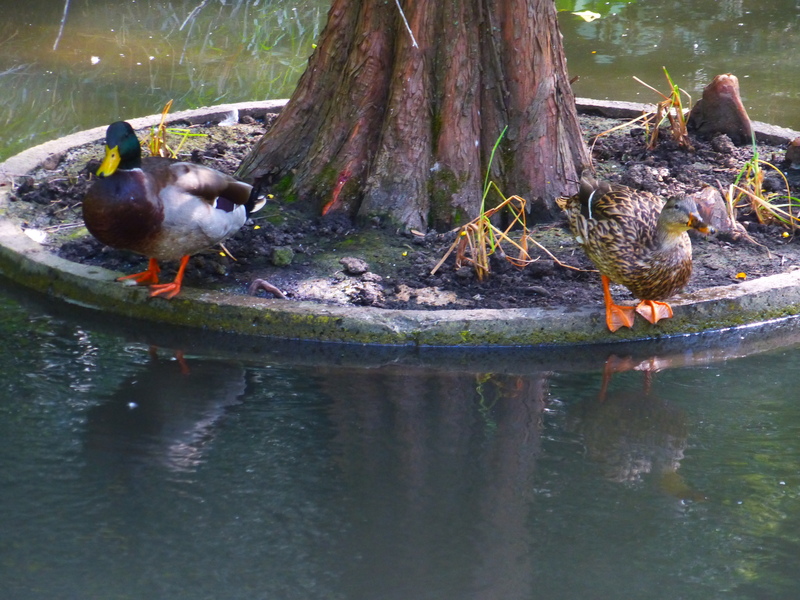 If Honey and James left Botany Pond now, they would just be joining a larger groups of ducks, not heading south. Jerry, I think you meant 15 degrees C, not F.
Nope. It was supposed to be 90 today and go down to 75 or so tomorrow. James’ yellow bill really stands out. Were Honey’s legs/feet that orange in the spring? I have a question about duck behavior. Since it is not breeding season, why is a drake and a hen hanging out together? Ducks will pair in the fall and stay together until after the ducklings hatch in the spring. I don’t know why but that is what ducks do. Hone picked her beau early and has taken him to the peace and quiet of Botany Pond. Smart girl. Nice to see Koi in the pond, were they added recently? Hopefully they survive winter. You and Anna have done an outstanding job, fattening up this pair as well as Honey’s brood, PCC(E). These are very healthy ducks! I still worry that I’m keeping the ducks here beyond when they should leave (presumably when it’s time to stage with the other ducks). Commenter George, in this thread, seems to know a lot about ducks, and all his posts indicate that Honey and James are doing just fine; indeed, that Honey is being most shrewd in cementing her relationship with James pre-migration. PCC is a typical helicopter parent. Although I guess a helicopter would be useful for a duck parent. I am in no way a duck expert. PCC(e) has forced me (us?) into learning about ducks. It has also made me much more cognizant of the environment. I notice things that in the past I just thought of as the background. In the suburbs where I live, there are many detention and retention ponds for rainwater. As well as forest preserves. I find myself stopping and looking – especially at the birds. Although all the resident Canada geese and their poop still annoy me. I may be completely wrong about what is going on in Botany Pond. But I am certain that the fact that Honey and James have not flown south yet is not a problem. The days when the skies are full of migrating birds is still at least a few weeks away.